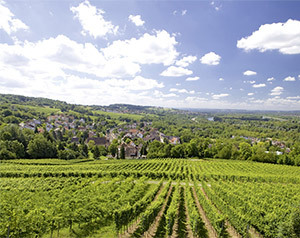 Badenweiler is not only picturesque, it also has an exceptional climate. Where the Black Forest gently descends down into the Rhine valley, this health and recovery oasis has a prominent position in rising atop a foothill to a height of 380-450 m. Green forested slopes form an impressive backdrop. And with Badenweiler the lovely landscape of Markgräflerland lies at your feet, in the truest sense of the term. 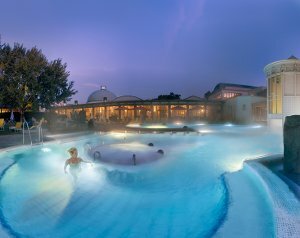 This location, a hilly, sun-drenched land, is famous for its pleasantly mild climate, its hot springs, with for its beneficial health and wellness services. Badenweiler has a conveniently accessible location with regard to the well-known major centres of Mulhouse, in Alsace (25 km), Basel, in Switzerland (40 km) and Freiburg, in Breisgau (40 km). 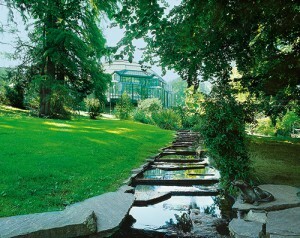 The thermal spa of Bad Krozingen is in the middle of the Markgräflerland, surrounded by the Black Forest and the Vogesen mountain range, in the vast plain of the Upper Rhine. The surrounding area is rich in forests and beautiful vineyard landscapes, and offers a variety of opportunities for recreation, sport, and leisure. France and Switzerland are directly ‘at the doorstep’, and it is only 15 km away from Freiburg, the Black Forest metropolis, with its cultural events and diverse shopping venues. The climatic advantages, plenty of sunshine, little rainfall, and relatively dry air, make Bad Krozingen and Markgräflerland into one of the most popular holiday regions of Germany.